Foodies…get ready! Visit Orlando has announced the return of its Magical Dining Month, with a bonus preview week August 24-September 30, 2018. Sponsored by American Express, the program was designed by Visit Orlando to showcase the wide variety of upscale and diverse dining throughout the destination, while also helping children in need. More than 100 restaurants across the Orlando area will participate, with 19 new to Magical Dining Month. The wide range of venues spans areas from Disney Springs to Restaurant Row near the convention center to Universal Orlando, as well as neighborhood districts in downtown Orlando, Winter Park and beyond. Each participant will be offering a three-course, prix fixe dinner menu for just $35 per person, with one dollar from every meal served is donated to a local charity. Also new this year are designated options for vegans, vegetarians and gluten-free diets, to better accommodate diners. And that’s only a quarter of all the great restaurants participating in this year’s Magical Dining Month! This is a great opportunity to try restaurants that are new to you, as well as enjoy favorites with friends. 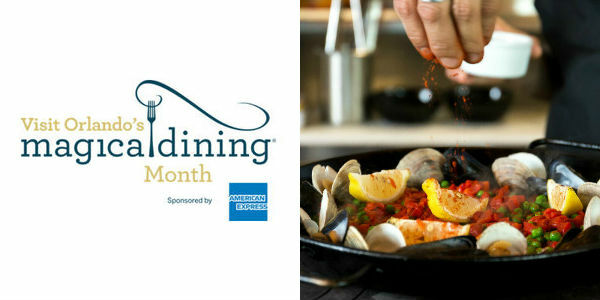 For a full list of participating restaurants, menus and to make reservations, visit OrlandoMagicalDining.com. Which ones do you want to check out? Let me know in the comments!